Gift ideas for Sales Reps. Incentive Awards. The Business Card Sculptures’ Dollar Sign sculpture under glass is one of our latest creations, and a numismatic masterpiece. It can be a symbolic special gift or incentive award. It’s perfect for salespeople, bankers, investors, collectors and retirees! Or anyone who worships the almightly buck! 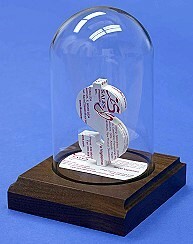 Here’s another symbolic gift idea; the Patriot Eagle Sculpture under glass.